When I was learning to cook I was a slave to recipes. While it was a good way to start learning different techniques and ingredients, it did have some frustrating limitations. Like what happens when you can’t buy a particular ingredient? And what do you do with that leftover half bunch of herbs? Or jar of sauce? Or worse still, what do you do when you need to eat but don’t have time to search through recipes and go shopping for exotic ingredients? Over the years, with a lot of trial and error, I began to learn to cook more instinctively, on my own. In my head, without really being conscious of what I was doing, I started thinking of recipes in general terms rather than specific ingredients. From there, I developed a collection of starting point or ‘template recipes’. So whenever I walked into the kitchen and looked into the fridge to figure out what to cook, I had a head start. I knew what had worked before to make that soup or stir fry and could use that knowledge as a springboard for a new dish or meal. Template recipes provide a stepping stone or ‘training wheels’ to help you take the first steps to freedom from recipes. They’re designed to give you some support and structure while also providing plenty of ideas to get you started. At the same time they are there to encourage you to think for yourself. To try new things. To experiment and develop your own recipes and style. The idea behind using template ‘recipes’ is that the ingredients are listed in general terms to encourage you to think about recipes in a different way. Just look down at the ‘variations’ to get ideas for what to use for each different type of ingredient. It’s all about building your confidence to start experimenting and cooking for yourself. Over time you’ll find yourself not even needing the templates but they act as ‘training wheels’ to get you started. 1. Heat a medium fry pan on a medium heat. Add butter and aromatic veg and cook for 5-10 minutes until the veg is soft and lightly golden. 2. Add legumes, ketchup and spice. 3. Stir and simmer for a couple of minutes to make sure everything is hot. Taste & season. butter alternative / dairy-free – any oil you normally cook with. 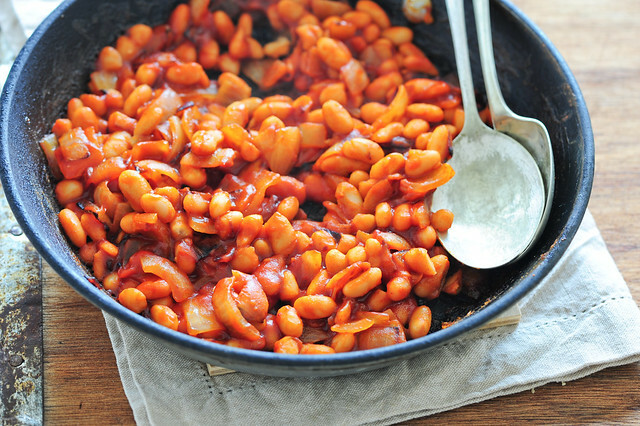 aromatic veg – onions are my favourite but celery or carrots would be good instead..
legumes – I’ve used cannellini beans in the photo but any canned or cooked legume will work. 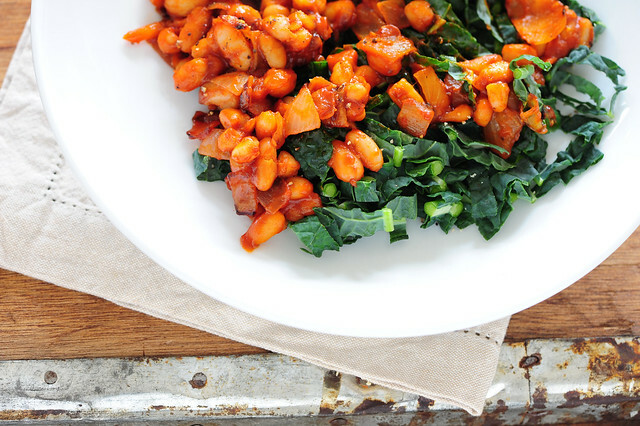 Try butter beans, borlotti beans, black beans, chickpeas or lentils. Note: a standard can is 400g (14oz). no ketchup? – I really recommend getting a small bottle to try with this dish. I’m not really a big ketchup fan but I adore these legumes. Otherwise try tomato paste and a big pinch or three of brown sugar. A good BBQ sauce will also work. spice – first choice smoked paprika. Next choice other paprika, dried chilli (you may like to reduce the quantity if really hot). Coriander seed or cumin would be interesting. And curry powder would work if you’re in the mood for a curry. higher protein – Preheat the oven to 180C (350F) while the onion cooks. When the legumes are done, make a small well in the middle and crack and egg into it. Bake for about 10 minutes or until egg whites are set and yolks still runny. Would you like to learn to cook without recipes? Then check out my ‘Master Your Meal Plan‘ online program which is starting at the end of this week! ps. 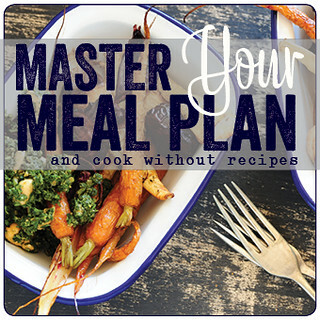 Wondering if the template recipes in ‘Master Your Meal Plan‘ will work for you? If you’re happy with your current meal planning system, then it’s probably not going to add much value. Unless you’d like to learn to cook more freely and creatively. But if planning your meals each week causes you problems, then more than likely, the Master Your Meal Plan system will help you. Karen, Master Your Meal Plan Owner. Kate, Master Your Meal Plan Owner. Daphne, Master Your Meal Plan Owner.